Treatment foster care (TFC; sometimes known as therapeutic foster care) is a family-based placement option for children with serious emotional, behavioral, or medical needs who can be served in the community with intensive support. This report describes how TFC is implemented and supported by states. 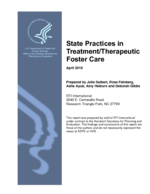 It provides an overview of the key program elements of TFC defined by states and how states differentiate TFC from traditional foster care. The report also provides a description of how states provide adjunct services, such as case management and behavioral health services, to children in TFC. Finally, the report includes information on the different funding strategies employed by states to support TFC services. Interviews with state officials and key stakeholders revealed that there is significant variation among state TFC programs. Although rigorously evaluated models have demonstrated positive outcomes in mental health, behavioral health, and delinquency, most state TFC programs do not use the evidence based models in their entirety but instead select and adapt elements of them, defining required components within agency regulations and contract specifications. The report’s appendix provides detailed profiles of 6 states’ TFC programs, in Connecticut, Illinois, New York, North Carolina, North Dakota, and Tennessee.